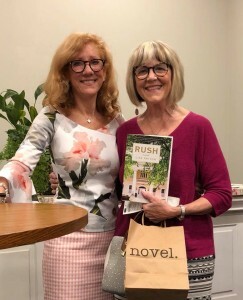 I recently had the pleasure of meeting author Lisa Patton in person, when she spoke at Novel books in Memphis, where she was launching her new novel RUSH. Lisa is a Memphis native, living in Nashville now. And although she went to school at the University of Alabama, she chose to set her story of sorority rush at the University of Mississippi. Next Sunday, September 30, is BID DAY at Ole Miss, so this is a good week to be thinking about what those girls are going through in the final days of rush. RUSH is set in 2016, so a lot has changed since I pledged Tri Delt at Ole Miss back in 1969. Reading about all the drama made me wonder how much was exaggerated, and I couldn’t wait to talk with Lisa Patton about this. I’m excited that she agreed to answer a few questions. 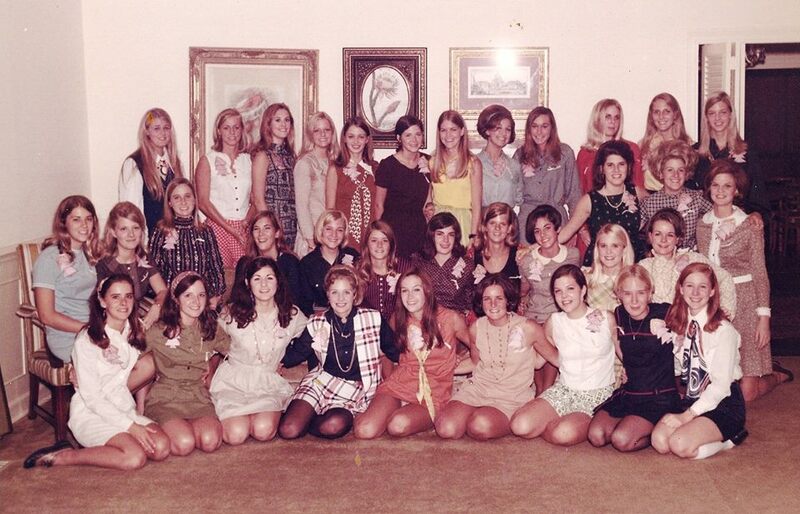 Pledge class of Delta Delta Delta at Ole Miss in 1969. I’m the second from the right on the second row from the bottom…with the bright yellow hair! Lisa: I loved meeting you, too, Susan! I’ve heard so many lovely things about you over the years and all I can say is: “It’s about time!” I didn’t exaggerate the rush drama at all. I had a bank of young collegians from not only Ole Miss but other SEC schools that kept me informed on all the current goings on. The mamas turn into Nervous Nellies and yes, the alums are very involved. Getting the story right was paramount; after all rush is one of the most sacred rituals in the South. And yes, there are dorm decorators! I interviewed the most prominent one in Mississippi for over two hours one night. She was incredibly generous with her information. I decided to set the novel at Ole Miss over Alabama for three reasons: First, Alabama wins too much ;-0! Some people love to hate The Tide and I couldn’t take a chance on a person not reading my story because of it. Second, as a Memphian I like to set my stories in my beloved hometown, and thirdly, Eli Manning had just been nominated for the Walter Payton Humanitarian of the Year Award and that fit perfectly within the context of my story. Lilith Whitmore, my antagonist, is satirical on purpose to make the point that although we try to cover it up, racism still runs deep. I wanted to use humor, exaggeration, and even ridicule to show that the southern racial divide still influences our decisions, whether we think so or not. Since THE HELP was set in the 60s, Kathryn Stockett didn’t need to use satire to portray Hilly Hollbrook or Elizabeth Leefolt. RUSH is set in modern day. Folks today are not as overt when it comes to racism. We’ve come a long way since the 60s but there’s still a long road to hoe. Susan: I keep thinking of comparisons to THE HELP, especially with your chapters from the point of view of Miss Pearl—the beloved African American housekeeper at the Alpha Delta Beta house. Did you live in a sorority house at Alabama, and were you aware of similar struggles that the staff there had, regarding the lack of medical insurance and other benefits, for example? What is the situation like for the staff in these sorority houses today? Have the women living in those sorority houses ever actually done something to try to change that, the way Cali Watkins and the other Alpha Delts do in the book? 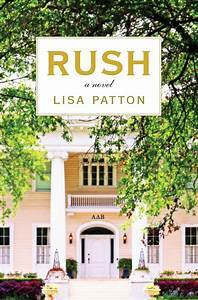 Lisa: I lived in my sorority house my senior year – third floor, right next to the TV room. We had daybeds in our rooms and slept on one big “sleeping porch.” I’ve often thought about those days and the deep great sleep I once enjoyed. The room was ice cold and we hunkered down under warm comforters. The noise from girls slipping in and out was blocked with the white noise from large fans. What I wouldn’t give to be able to sleep that hard today! I was not aware of the struggles facing the staff at sorority houses. As much as I hate to admit it, I was a self-absorbed college student. I never once thought about it back then. And the ladies cooked and cleaned for us every day. When I learned about it as an alum (I’m betting most alums have not thought of it either) I was sorry I’d never considered their needs and hoped I could bring awareness by including it in my story. Most sorority and fraternity houses don’t offer staff benefits although some of the houses now outsource their staff for that reason. Recently, I learned about a young woman at the Tri Delt house at Ole Miss who started a Go Fund Me page for their cook, Mr. Kenny. He had double hip replacement surgery and had to be off work for three months. Last I checked the page has raised $20K toward the $75K goal. That’s a perfect example of RUSH in action. I’m so proud of the young Tri Delt girls for helping Mr. Kenny. Susan: I’m also proud of my Tri Delt sisters at Ole Miss for helping Mr. Kenny! Like you, I wasn’t aware of our house staff’s needs at all when I was in school, so it’s encouraging to see this generation stepping up. In an early scene in RUSH, you show the daughter of Lilith Whitmore getting drunk during the tailgating parties in the grove before the first football game of the season. How much do you think drinking is a problem on campuses like Ole Miss and Alabama today, and what do you think is being done, or needs to be done, to change the social milieu in order to make college a safer place for teenagers and young twenty-somethings? Lisa: I think drinking is a problem on most college campuses. The drinking age was 18 when we were young so I think some parents are fine with their children drinking after they reach a certain age and tend to look the other way. I’ve heard of several providing a “safe place” like home for their kids and their kid’s friends to drink. Honestly I don’t know what the answer is. Until fake IDs are controlled and parents stop looking the other way I doubt things will change. I’m not sure that there is an answer. Susan: Your earlier books—Whistlin’ Dixie in a Nor’easter, Yankee Doodle Dixie, and Southern as a Second Language—are all humorous. And your stylish humor is evident in RUSH, but you deal with serious topics. Did you set out to write a more serious book this time? Lisa: Yes, I knew when I tackled the issues of race, equality, and inclusion the book would have to be more serious, but I love humor and I wanted to make sure my book had plenty of it. That’s why I used satire and poked fun at dorm room décor and mother daughter relationships. The most fun I had was writing about Wilda’s 81-year-old mother. I would sit in my room and laugh till tears rolled down my cheeks at the absurdity of her vanity and snobbery. As you well know, writing can be quite lonely. Without adding humor into my stories I would lose my ever-loving mind!